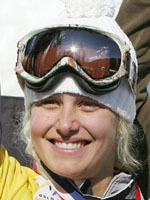 Napoleon Bonaparte once suggested that the 'noble and magnificent is never far from the trivial and the laughable', and snowboard princess Lindsey Jacobellis could only hang her head and agree after the infamous debacle at Turin that cost her and the United States an Olympic title. She had been well out in front in the four woman final of the inaugural snowboard cross event at Bardonecchia when by her own admission she got overexcited and played to the crowd. Attempting an unnecessary board 'grab' on the penultimate jump, she ended up in a heap in the snow as Switzerland's Tanja Frieden sped past her to take the gold. The botched 'grab' led to an outpouring of groans, grief and scorn in the United States, although fascinatingly enough, none of that came from the snowboard community, who felt her action was in the spirit of the event. And let's not take anything away from Jacobellis, who leapt up and dashed for the line for silver, for the woman with the curly blonde locks and sky-blue eyes has towered above this event for all the right reasons too. She was born in Roxbury, Vermont August 19, 1985 and she went out to Turin not only as triple X-Games champion but also as 2005 world champion, an event incidentally which took place at a certain Whistler mountain in Canada. Jacobellis put the Olympic disappointment behind her and won the 2007 world championships gold at Arosa Switzerland, the 2008 and 2009 X-Games titles and the 2007 and 2009 World Cup crystal globes in snowboard cross. A track record which makes the smiley and affable athlete the outright favourite to right the wrongs of Turin out on the slopes at Vancouver. After her antics at Turin some saw her as the Bode Miller of SBX, in reference to Miller's seeming preference for outright thrills rather than gold medals. To hear Jacobellis speak, her language peppered with snowboard jargon such as 'stoked' (happy), or 'bummed' (unhappy), one might feel she was the typical slopes hippy, but her CV clearly banishes the comparison with Miller. Now it's up to her to banish that colossal blooper, one of the defining moments of the Turin Olympics, by giving those American fans the medal they all thought was in the bag before that fateful grab.